Die Herstellung einer Kaffeemaschine, die bestmöglichen Kaffee brüht. Das heißt im Wesentlichen, Brühtemperatur und Extraktionszeit sind bestmöglich abgestimmt, die Maschine ist extrem sicher und feuerfest, Brühelement und Warmhalteplatte funktionieren unabhängig voneinander. Alle Maschinen werden in Amerongen, Niederlande, handgefertigt. 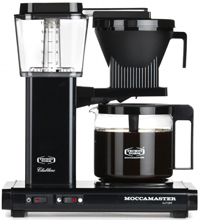 Da uns die Maschinen von Anfang an überzeugen und perfekt zu unserer Philosophie passen, kann MOCCAMASTER bei uns probiert und bestellt werden. 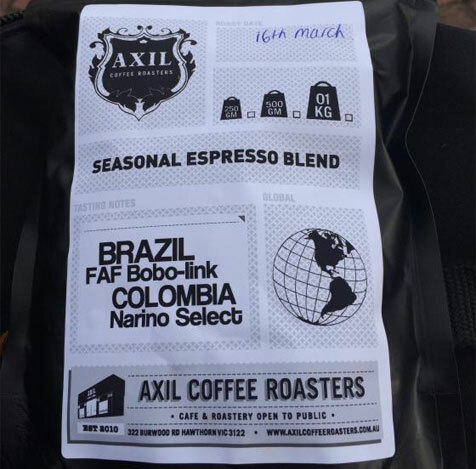 This month, we are pleased to introduce you to Brazil Bob-O-Link, a single estate coffee from the Zani family’s small farm in the Mogiana region of Brazil. The Zani family has produced an exceptional crop of specialty coffee this year using varietals whose fruit ripens to a bright yellow color. We hope you have the opportunity to try a cup of these very limited Yellow Catuai and Yellow Icatu beans that we have roasted right here in New England. Brazil Bob-O-Link is the result of a coffee project pioneered by Fazenda Ambiental Fortaleza and its network of smallholding farmers, who put environmental sustainability at the forefront. When Silvia Barretto inherited Fazenda Ambiental Fortaleza (FAF) from her family in the early 2000s, she and her husband Marcos Croce immediately began the work of implementing sustainable agriculture practices on the farm. However, they soon realized that in order to produce high-quality coffee in harmony with nature, they would need to collaborate with the dozens of family farmers who surround Fazenda Ambiental Fortaleza and have an equal stake in protecting their shared environment. 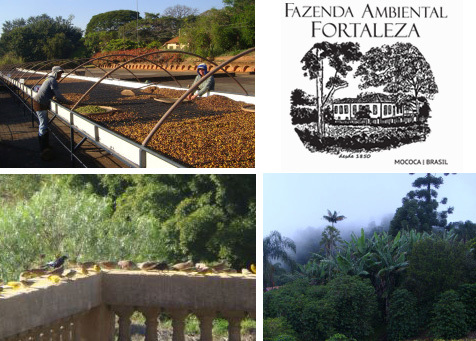 Together with their neighbors, Fazenda Ambiental Fortaleza created the Bob-O-Link network, a group of farmers who work together to preserve the quality of the natural water springs on their land, manage the soil using organic practices, and plant fruit trees for shade. These banana, mango, and avocado trees also help to sustain the habitat of the many birds and other animals that live in the Mogiana region. One of these birds is the bobolink, a small blackbird that gives this Gold Cup coffee its name. Every year, the bobolink migrates from the northern half of the United States all the way to the southeast edge of South America, settling into the shaded canopy on Fazenda Ambiental Fortaleza and the network of Bob-O-Link farms to spend the winter. The bobolink serves as a powerful symbol of the interconnectedness of our global environment and the power of quality coffee to create a positive impact that transcends national borders. The high value that the Bob-O-Link farmers place on environmental sustainability translates into a coffee that is meticulously grown and processed. After harvesting, the farmers use both hand-sorting and mechanical color-sorting to remove underripe cherries and other defects. 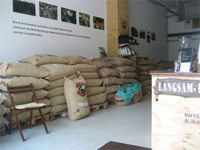 This coffee from the Zani family farm is naturally processed and sun-dried on raised beds. The Zani family’s painstaking work yields a bright, full-bodied coffee with notes of milk chocolate, citrus, and blackberries. 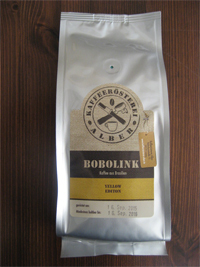 We couldn’t be more excited to feature Brazil Bob-O-Link as our Gold Cup coffee this month. Brazil Bob-O-Link is available for a limited time only in our online store, at Fazenda Café, and in other select locations. We can’t wait for you to try it. Kalt extrahierter Kaffee gibt dem Begriff "kalter Kaffee" ein ganz neue Dimension. Nahezu säurefrei, wenig Koffein, ungewohnt rund und samtig weich. Die Leute sind begeistert, mochten doch die wenigsten bisher kalten Kaffee. Man erfährt ganz neue Aromen und schmeckt ein erfrischend- belebendes Getränk, welches man nicht sofort mit Kaffee assoziiert. Besonders für warme Tage oder abends. Probiert es aus! 50- 60g frisch gemahlenen Kaffee mit ca. 1 Liter kaltem Wasser aufgießen und umrühren. Abgedeckt 8- 10 Std. ziehen lassen. Gekühlt 2- 3 Tage haltbar. Like its territorial song in early summer, the bobolink's recent listing as a threatened species under Ontario's Endangered Species Act 2007 (ESA) is bubbling on the back burner while government officials and stakeholders, including farmers, struggle with the implications. The designation came as a surprise to many farmers. Bobolink are still quite common in parts of the province, the males distinctive in their breeding plumage⎯light-coloured on the back and black beneath, with a patch of yellow on the back of the head. Current population estimates peg the Ontario population at 300,000 – 400,000 breeding pairs. We usually think of species at risk as ones that are rarely seen and whose populations have declined to small numbers. By that time, though, it's almost too late for their continued survival. Ontario's ESA aims to change all that. Its approach is to act sooner than later when there is evidence of a species under threat or in decline. The Act provides for a Committee on the Status of Species at Risk in Ontario (COSSARO) that reports to government and considers such species and recommends them for protection, where warranted. In the bobolink's case, populations have declined over 50% in the last ten years, prompting COSSARO's recommendation for listing. COSSARO’s recommendations are based on the best available scientific, community and aboriginal traditional knowledge. While the Committee does not consider social and economic consequences in their assessment, the Act does provide for socio-economic considerations. The bobolink designation has potential impact on normal farming practices. The ESA prohibits killing or harming an endangered or threatened species, or damaging or destroying its habitat. Bobolink nest in hayfields. Timing of haying coincides directly with the peak nesting season for bobolink. This puts farmers in potential contravention of the Act. A host of agricultural and conservation interest groups, including Ontario Cattleman's Association, Ontario Sheep, Dairy Farmers of Ontario, Ontario Soil and Crop Improvement Association (OSCIA), Ontario Federation of Agriculture, Ontario Nature, Carolinian Canada and Bird Studies Canada among others are involved in ongoing discussions to find workable solutions. Delayed hay harvest until mid-July is not the answer. Recent research has shown that delaying the timing, and changing the frequency, of hay harvest can significantly increase reproduction of grassland birds by avoiding disturbance during their nesting season. However, there are factors of nutritional quality, yield and palatability of forage crops from the farming perspective that cannot be ignored. Current haying practice aims for higher quality nutrition for greater livestock productivity and that requires earlier cutting. Fields of primarily alfalfa are not as attractive to bobolink for nesting due to their higher density and limited diversity; therefore the practice of earlier cutting in such fields is not a significant issue. For farmers relying on grass hay, however, delaying harvest until mid-July, the end of the bobolink nesting season, is not a viable option on a large scale. Grass hay, especially that in longer established hayfields, is precisely where bobolink prefer to nest. Bobolink declines are also linked to habitat loss. Fewer small herds of cattle on pasture due to recent difficulties in the beef industry, and abandonment of farms in some cases, are resulting in former hayfields and pastures reverting to shrub-land and forest. Here's a twist though. According to breeding bird surveys, the highest densities of bobolink occur in a broad band across southern Ontario from Huron County in the west, through the Dufferin Highlands and on into Renfrew County in the east. Interestingly, this coincides with the beef industry's cow-calf belt. With cow-calf producers in the best position to provide bobolink-friendly nesting habitat, but also with their own industry struggles, it becomes a case of save the farmer, save the bird. COSSARO is considering other grassland species for designation, as well, suggesting the need for an approach that deals with not just bobolink, but with protection of grassland habitat in general. Working together, agriculture and conservation groups have recently developed a concept for protecting Ontario's bobolink habitat, as part of a larger grassland recovery effort. This concept involves a call to government for a temporary three-year exemption for farmers as allowed under the ESA, matched with encouragement for incentive and research programs for grasslands stewardship. The exemption would allow farmers to continue current agricultural practices without fear of liability. In the meantime, research projects and stewardship initiatives would investigate best management practices for both profitable grassland production and enhanced understanding of grassland conservation issues. There's no question that private land stewardship is key to maintaining habitat for Ontario's wildlife, whether at risk or not. Cost-share programs in recent years, such as the Canada-Ontario Farm Stewardship Program (COFSP) and the Species at Risk Farm Incentive Program (SARFIP) both delivered by OSCIA, have encouraged stewardship and provided financial incentives and offset associated costs. Continued incentive programs are essential. Farmers aren't the only ones who can help. Encouraging non-farm rural landowners to leave suitable areas in grassland rather than allowing conversion to forest is another avenue. Public lands, such as Conservation areas, parks and open space, also hold potential for creating grassland habitat. In the end though, farm businesses hold the key for ensuring the continued presence of bobolink and other grassland species. The challenge is in finding ways of sharing common ground.